Two one-hour documentaries on The Byrds, the continuously groundbreaking band who bridged the gaps between The Beatles, Bob Dylan, Pete Seeger, the Beach Boys, the Los Angeles psychedelic underground and classic country. Their memorable music set the stage for everyone from the Eagles to Tom Petty to R.E.M. Each hour is hosted by singer-songwriter Laura Cantrell, and covers a distinct period of their prolific history that can either be aired as one two-part series, or as your choice of two insightful one-hour programs. Both shows are available here in 0:59 and 0:54 (for news-hole) versions. Instead of being directed by the singular vision of one leader, The Byrds were consistently led by everybody's contributions - from their original five members to the musicians involved with their later years. Despite the inner turmoil that resulted in a revolving cast of characters, the Byrds always used those changes as opportunities to further their musical evolution. "They all brought something new and something defining," says journalist David Fricke, "and it all became part of the Byrds sound. They didn?t change the Byrds to the degree that it changed the sound. What they did became the Byrds." 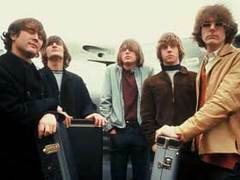 Both segments feature the wide range of music that made The Byrds of the 60s most influential bands, along with comments by its two longest-lasting members: Roger McGuinn and Chris Hillman. Writers David Fricke, Anthony DeCurtis, Lenny Kaye and Byrds historian Sid Griffin are also interviewed. THERE IS A SEASON covers 1964-1967, the all-too-brief hitmaking years of the Byrds' original five members - Roger McGuinn, David Crosby, Chris Hillman, Gene Clark and Michael Clarke. They were an electrified folk band who topped the charts with some of the decades' most innovative singles and albums. By 1967, their musical harmony was engulfed by the off-stage disharmony that pushed them to reach those heights. FARTHER ALONG picks up the story in 1968 and details how the Byrds' legendary Act I was followed by one of rock history's most fascinating second acts. Despite their lower record sales, the Byrds' later incarnations alternately defined and re-defined "country-rock," thanks to the influential contributions by folks like Gram Parsons and guitarist Clarence White.